The majority of 2020 Democratic hopefuls are sponsoring or considering plans to dismantle the electoral college. Their pledges follow a growing movement for change at the state level and represent frustration over twice losing to Republican candidates in the past 20 years — Donald Trump and George W. Bush — despite winning the popular vote. 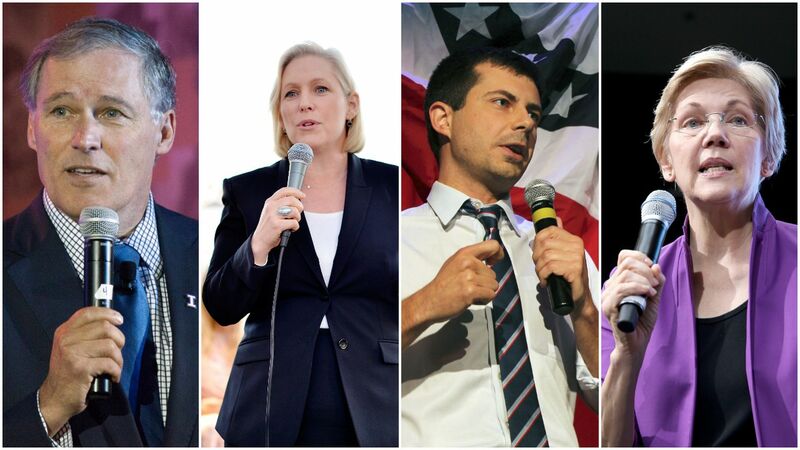 By the numbers: Eight Democratic 2020 candidates support eliminating the electoral college in favor of the popular vote, per the Washington Post. Four Democrats are open to the idea, and only 3 want to keep it. Sen. Cory Booker (D-N.J.): "I believe very simply that, in presidential elections, the person with the most votes should be the president of the United States," Booker said in a CNN town hall. But he doesn't believe the electoral college will be abolished anytime soon, and he added, "We have to win the next election under the rules that are there now." Former Texas Rep. Beto O’Rourke: "You had an election in 2016 where the loser got 3 million more votes than the victor. It puts some states out of play altogether, they don't feel like their votes really count," O'Rourke said to an MSNBC correspondent. He also supports improving the electoral college by having states award electors proportionally as a stopgap before the college is potentially eliminated, per the Washington Post. Sen. Elizabeth Warren (D-Mass. ): She called for ending the electoral college at a CNN town hall in March, endorsing "a constitutional amendment that protects the right to vote for every American citizen and makes sure that vote gets counted," saying "the way we can make that happen is that we can have national voting and that means get rid of the electoral college." Former HUD Secretary Julián Castro: He identified eliminating the electoral college as one of the "important first steps" for enabling more Americans to "participate in democracy." Gov. Jay Inslee (D-Wash.): "It ought to be one person, one vote," he said in a Vox interview. Inslee also encouraged other states to join the National Popular Vote Interstate Compact, which currently has 14 states and D.C. signed on in support. "As soon as you get to a majority of states, you wouldn’t need a constitutional amendment." The compact has 189 out of the necessary 270 votes to be enacted. South Bend Mayor Pete Buttigieg: "It’s gotta go," Buttigieg told Washington Post columnist Greg Sargent. "We need a national popular vote. It would be reassuring from the perspective of believing that we’re a democracy." Sen. Kirsten Gillibrand (D-N.Y.): “The Electoral College has distorted the outcome of elections and disenfranchised millions of voters, and I think that’s wrong. I believe that it's time to get rid of the Electoral College, and I am ready to fight in Congress and around the country to pass this Constitutional Amendment to do that," Gillibrand wrote in the bill she introduced in April alongside other Democratic senators. New Age spiritual guru Marianne Williamson: "Changes to the Constitution should not be taken lightly, but at this point there is too much of a risk to our democracy when the popular vote can be so easily overridden," Williamson told the Post. Former Rep. John Delaney: "If I was starting from scratch, yes, but trying to abolish the electoral college now is impractical," Delaney told the Post. Former tech executive Andrew Yang: "Abolishing the electoral college would be difficult and would wind up further favoring high-density high-population areas with big media markets that would be the focus of national campaigns," Yang told the Post. But Yang supports making changes "to the way we select the president, including how electors are apportioned and implementing ranked-choice voting." Former Colorado Gov. John Hickenlooper: "While many of us are frustrated with the way the electoral college works ... there is no possibility of abolishing it in the near term," Hickenlooper told the Post. Sen. Kamala Harris (D-Calif.): "I'm open to the discussion," Harris said in an interview with Jimmy Kimmel. "I mean, there's no question that the popular vote has been diminished in terms of making the final decision about who's the president of the United States and we need to deal with that." Rep. Tulsi Gabbard (D-Hawaii): "There are reforms that need to take place to make it so that our votes are being cast, and counted and represented in the outcome of our elections," Gabbard told a Fox News reporter. "I think there are pros and cons to the existing electoral college and to getting rid of it." Sen. Bernie Sanders (I-Vt.): "I believe that it is hard to defend the current system in which one candidate receives 3 million votes less than his opponent, but still becomes president," Sanders told the Post, adding that he believes "we need to reexamine the concept of the electoral college." Sen. Amy Klobuchar (D-Minn.): She told the Post she is open to eliminating the electoral college, but did not provide further details.